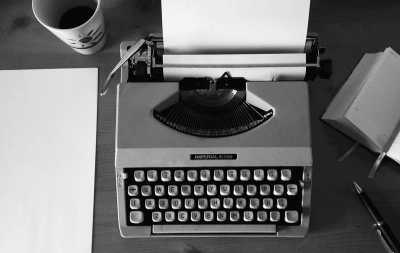 What makes your copy compelling? There are tons of articles detailing how power words will help your message stand out. How telling stories is the key to eliciting an emotional response and sense of camaraderie. And of course using classic formulae like AIDA to walk users through the different stages to a purchase decision. These are common steps marketers implement in an effort to create copy that convinces and converts. But copywriters and marketers worth their salt go one step further. They follow the methods outlined by the messiah of advertising David Ogilvy. They dig deep into audience research to discover the problems, solutions, and angles that are going to have the most impact on their audience. And that’s great, right? I mean, no one cares about you as the brand. The most successful businesses solve a problem of their target audience. Their marketing simply communicates how they’re the best at solving that problem. So all you need to increase conversions is swipe your copy directly from their mouths. To take their witty thoughts on the benefits of your brand or product and feature them on your homepage. BOOM – you’ve got yourself some killer copy that’s guaranteed to resonate with your target audience. That’s the prevalent belief anyway, and I tend to agree with it… to an extent. Why only to an extent? Well, take a look at some of the brands that really stand out from the crowd with their content and messaging. Do they simply parrot what their users have said? No. They take what their users feel and put their own personal spin on it. There’s some incredible advice on how to create compelling copy out there. But finding those hot button topics and killer phrases is only half the battle, you’ve also got to understand how to showcase your brand’s personality. That’s exactly what I’m covering in this piece. Every marketer has read the classics on copywriting and persuasion. They all know about AIDA, everyone’s studied Ogilvy, and we’ve all memorized Cialdini. Great modern marketers build on this fantastic legacy knowledge through analysis of the best digital content on creating effective messages. They’ve pored over Joanna Wiebe’s thoughts on swiping copy, analyzed MailChimp’s style guide, and are subscribed to the social feeds of great writers like Aaron Orendorff and Joel Klettke. There’s part of me that wants to wax lyrical about the wonderful times we live in when all of this information is readily available to us. However, there is a downside to the freedom of this information; it creates too many copycats and a homogeneous atmosphere in which very few stand out. Generally speaking, there are a handful of influencers in any given industry. There’s also only a handful of classics informing the strategy of today’s ambitious businesses. Eventually, everyone follows pretty much the same advice. You see this a lot with content marketing. Someone, somewhere achieves something impressive, and before the month is out, everyone is copying their method, sometimes even their tone and style. And sure, it might bring some good results. But as time goes, the saturation of effective information, tactics, and strategy start to damage their own effectiveness. They start to become the norm and lead to a lesser version of banner blindness. Effective marketing is the result of standing out from the crowd and delivering a message or experience that resonates with your users. But by following the tactics and strategies of those already more established than yourself, you’re simply joining your voice to a crowd of countless wannabes. You’re not standing out, not grabbing attention, not making an impression. All you’re doing is ensuring you’re yet another forgettable copycat. Great brands innovate, they don’t replicate. They experiment with unusual methods and discover peculiar new trends that skyrocket success. For you or your brand to stand out from the crowd, you need a differentiator. A differentiator which goes beyond a snappy little USP that grabs attention and continues to build a relationship with users over time. In every case, from the personal friendships you foster to those running a professional business, there’s one thing which continues to attract the best of friends and a huge, engaged audience. This isn’t a case of promoting content through Facebook or with PPC, it’s not even a case of adapting tried and true formulae. It’s the ability to show more of yourself in a genuine way. When people show their true personality, it’s polarizing. Yes, you’ll piss some people off because they don’t like your language or the opinions you hold, but at the same time, you’ll attract fervent fans who view your outspoken honesty as a much-needed breath of fresh air. Personality is polarizing, and polarization is good for business. Taking an apathetic approach and trying to please everyone achieves nothing. To stand out, you’ve got to make a stand. You’ve got to do something different with the tried and true formulae we all know and love. Take a look at the music industry. Those from aging generations are always quick to point out how every pop song now sounds the same. And you know, they’re kinda right. Just like you and I in the marketing world, the music execs have figured out what sells records. They have a formula of sorts they can use time and again to create hit singles. Often people parrot this with anecdotal evidence, but there are scientific studies and experiments to back this up. Scientists studied 500,000 albums and discovered that simplicity sells. That by dumbing down the musical complexity made it easier for users to enjoy. Uniformity makes music easily accessible. It allows us to listen to different artists and appreciate them from the get go. We don’t have to strain ourselves to study and understand new musical genres or styles because everything is what we expect. One of my favorite examples is from Norwegian comedian, Anders Nilsen. Anders is not a musician, but collated the shared aspects of a number of summer hits to see if he could make the next big thing. The song makes zero sense lyrically but proved the point that if you know the formula, you can see some great results. “Surely not, ” you say. “I’m a music lover, and this is just a case of a successful marketing campaign poking fun at an anecdotal problem in the industry”. Well, sorry to burst your bubble, but the issue of a homogenous sound is prevalent in all genres. If you don’t believe me, then check out Sir Mashalot’s videos. There is an evident, and prevalent formula in pretty much every genre of music. One which has been tried, tested, and perfected over years of use. But if every band and artist sound the same, then there’s no point in becoming a fan of any one artist. There’d be nothing to pull you towards different performers in the same genre. No need to favor Katy Perry over Taylor Swift, Jay Z over Biggie, or Marilyn Manson over Rob Zombie. And yet people do have their favorites, and they’ll defend their preferences with astounding vigor. So what is it that forms these stronger bonds? What differentiators add flavor and individuality into the cut and paste templates we’ve all come to know and love? Forgive me while I stick with the pop analogy for a little while longer. It’s true that, like in marketing, there are tried and true formulae to bring success in growing yours or your client’s businesses. It’s also true that stepping outside of these frameworks, while commendable, often doesn’t bring the same kind of results. The artists and marketers that make it huge are those who operate on the fringes of those frameworks. They follow the tried and true methods, but they pull in a huge amount of their own external influences and personality. They don’t copy everything from those more established. They might implement the same methodology, but they do it with their own individual flair. There are dozens, likely hundreds, of artists out there who could give Katy Perry a run for her money from a vocal perspective. So why is she so big? Because when launching her pop career, she did something different. She took the tried and true formula to make a catchy song and added a controversial element that would get people talking. Love it or hate it, I Kissed a Girl put Katy on the map. It got people talking about her and got her name into the papers. It divided the straight and gay communities with some supporting her message, while others denounced her for it. But it did its job. It made an impact and helped Katy make a name for herself. Shakira is another prime example of how being different works. The Latin music industry is huge. To stand out from such fierce competition, you’d need something that really makes people sit up to pay attention. Shakira did so with her unique voice. A voice she herself admits can sound a little like a yodeling goat. David Bowie was just another struggling performer before the 70s. However, he shot to A-list fame after adopting the Ziggy Stardust persona. It was standing so far apart from the crowd that got him the attention that launched his career. Finding this unique angle takes time. Each of these artists went through a tonne of trial and error. Before I Kissed a Girl, Katy Perry was struggling to break into the big time and sang as a backup singer in an alternative Christian rock band. You’ve got to try several different approaches to find your unique angle. And, despite what you read online, that uniqueness is not just crafting a killer USP. It’s far more than that. A USP is not a simple tagline to use on your site. Like Bowie, it should be a persona, one that informs all of your content and copywriting endeavors. Let’s leave the world of music behind and get onto some real life copy examples. MailChimp has done a great job of creating a continuous brand voice. They’re often pointed to as a great example of how to create a style guide that makes an impression. The above is a snapshot of the tone of voice section of their whole brand style guide. The whole style guide consists 16 sections covering everything you need to know on how to write for MailChimp. Their uniqueness is not simply a tagline about “sending better email” it’s a personality that permeates everything they do, from their blog content to landing pages and even their social media. You can go check it out. Scroll through everything they do and you’ll see there’s a definite continuity to the copy they produce, regardless of author or channel. Brewdog was a small Scottish brewery. I say “was” because, thanks to their rather unorthodox marketing, they’ve quickly grown to become a major player exporting their product across the globe. They’re most well known for their punk type vibe and their love of fostering controversy. A quick Google will turn up some of their more famous antics that have led to a great deal of publicity. The one that sticks out in my memory was their purposeful attempt to get a beer banned, cause everyone loves things they can’t have, right? Brewdog however, launched a £10, high percentage bottle of beer advertised as the beer made for drinking to excess. It ruffled some feathers and made some folk angry. 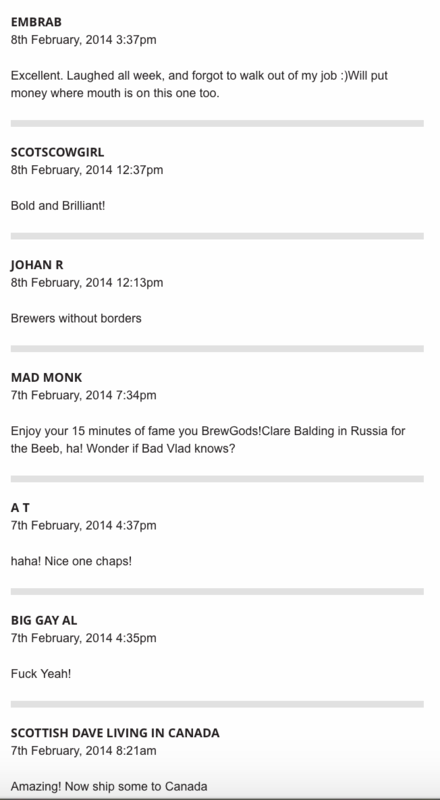 And yet, rather than back down, Brewdog stuck to their punk philosophy. They defended their decision and called out the regulatory body on a misguided decision. The punk-esque, rebellious nature of the brand isn’t just demonstrated in press releases and product names. It permeates every piece of content and marketing collateral they produce. It’s so distinctive that fans of the brand can spot their influence and product a mile away. Take their crowd funding efforts as an example. Brewdog has always looked to their existing customer base for help with expansion funds. 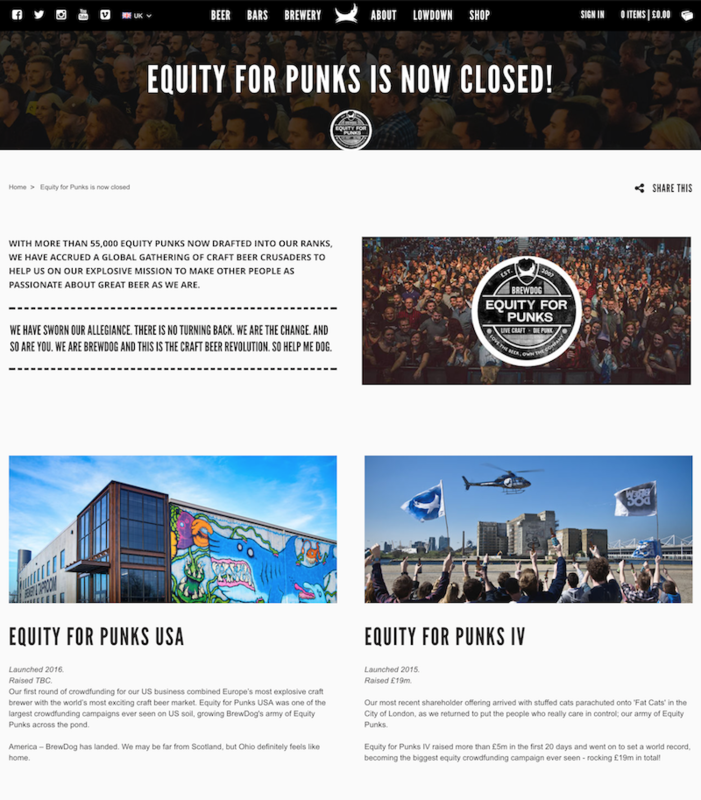 But rather than doing what so many brands do and taking a boring, financial centric approach, Brewdog continued with their rebellious punk image. Everything from the campaign name to the headline, descriptive text to the launch celebrations are in line with their image. An image which is why so many of their fans absolutely love the brand. 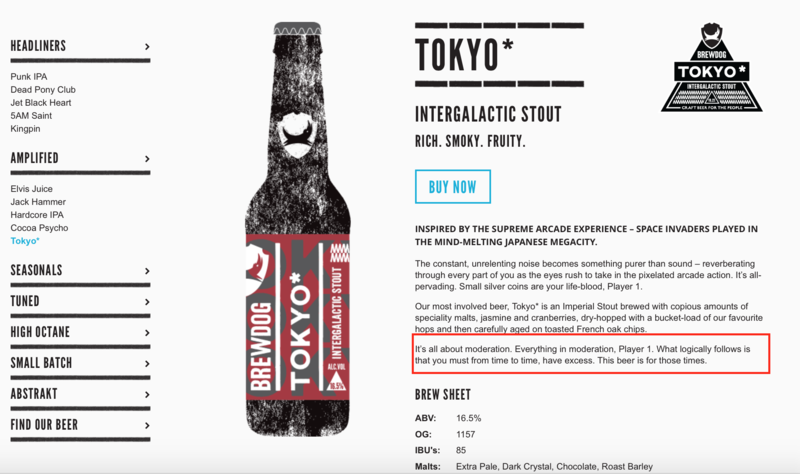 Sure, Brewdog may have pissed some people off by advertising a beer that’s for drinking to excess. Their rebellious punk image, hiring tanks to storm the Bank of England for a round of funding, and releasing beers mocking world leaders through marketing to “uber hetero men” are all divisive but true to the brand image. And nobody is apathetic towards the brand. No one is saying, “Brewdog, oh yeah, they’re guys who brew beer, right?”. People are either saying they’re complete heathens, or hilarious and witty. Brewdog doesn’t care about those in the former camp. They’re not right for them. They care about fostering a real connection and sense of community with those in the latter camp. Because the stronger that bond is, the more money they’ll bring in. That’s where the money is made. Not in creating a wishy-washy image that’s easily forgotten, but in creating something people can strongly associate with. Creating a brand image and voice that resonates with a certain segment of your target audience. When it comes to marketing, there’s a tonne of overlap. Brands in every industry will use the same tactics, template, and tips to help grow their business. They’ll all adopt the same headline formulae, near identical growth plans for similar products, and their focus will always be on the same metrics. The difference is in how they apply their own unique angle. An angle which will piss some off, but also attracts just as many to who are willing to open their wallets and throw money at your feet because they feel a sense of camaraderie and community. Finding your unique angle is your first big win. It might take you a couple of tries to narrow down on the angle that’s most resonant, but once you have it, you have a direction for you and your brand. Bowie was just another singer until Ziggy Stardust. Brewdog would be just another brewer without their rebellious punk image. Neither is now a member of the boring, generic masses they stepped away from. They did something people wanted to relate to, something different that caused people to sit up and take note. A good deal of those people like what they saw and, needing a breath of fresh air, jumped on board heart, body, and soul. The million dollar question is not in the need for a unique brand tone of voice. It’s how to find it. The goal is to not become one of the derivatives. You know what I mean. Every time someone does something of note, there’s a slew of copycats who push their own bastardized, poor imitation copy of the original. These copycats never last long because their work, while also inferior, is easily identified as a copy. You’ve got to find the angle and tone unique to you, and you’ve got to do it ASAP. You can still swipe copy and use customer thoughts while you’re zeroing in on your unique angle, but you have to figure out what tone will be best to serve it back to them. Here’s how to get your first start in finding your brand’s tone of voice. Step One – Analyze why you set up your business in the first place. Before you know where you’re going, you’ve got to know where you’ve come from. I always run through the below questions with clients to get a better understanding of what it is that got them to take action and to understand their core values. When you set up your business, what was it you were trying to achieve? What was/is the major pain point in the community as you see it? 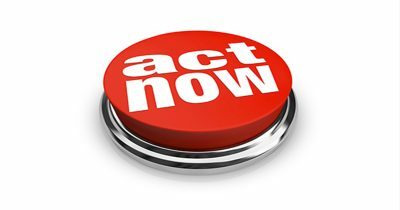 Why did you feel compelled to take action? What’s the problem with current solutions? What would be your ideal result of this endeavor for both you, and your clients/customers? These questions give a good indication of what it is you’re trying to do. As a business owner, you’re going to be passionate giving some of these answers. That passion is what you’re looking for. You’re looking for the thing that makes you want to take the hard hits, the passion that gets you out of bed in the morning when it’s all going wrong, the passion that will transfer over to your core audience. Find the passion in your core values, and you’ve got the first block of your brand tone. Grab as much of your current content from as many sources as you can. Look at your blog posts, emails, and social media updates. Go through them starting form the most highly engaged to the least and look to find the common trends. See what phrases, wording, messaging, and intent appears most commonly. Put more focus on the highly engaged pieces as the phrases, wording, messaging, and intent is obviously more successful at driving engagement and attention. Cross reference these against your brand values to find the perfect examples of elements that align with your passions and resonate with your audience. Whether you’ve recently started out or been doing this for years, there’s a core group of users who will interact more than anyone else. They might share your content more on social media, comment on blog articles, or reply to emails. Look at those who engage the most and reach out. Reach out to them and ask what it is they most enjoy about your brand, the marketing, and your tone. These high engagers are your key demographic and you need more like them. So follow their lead and advice. Now it’s a case of cross referencing your core values, existing high-value content, and user feedback to find the most highly repeated elements. Think of it as a Venn diagram where those in the central overlap should be placed at the center of your new tone of voice campaign. At this point, I’d recommend whittling it down to a handful of phrases. Five’s a good number at this point as that gives enough clarity without becoming confusing. After you have these guiding statements, feel free to add any extra information on peculiarities and advice for areas that don’t fall into the short statements. You might think at this point you’ve found out exactly what’s going to work best. However, there’s nothing wrong with gaining a little extra feedback to really polish what you have. Amend a couple of pieces of your lower engaged with content, pages that aren’t converting so well, or even create some new pieces based on your tone. Then, re-enlist the help of your high engagers to get their take on the new pieces. See what they have to say and ask them how they enjoy them compared to the pieces you sent the first time around. The feedback you get at this point should be used to flesh out your existing tone guide. It’s there to optimize the guiding principles and fill out any extra sections that will inform your tone and style. There shouldn’t be too many big changes, but this is the last opportunity for a while to really understand how your tone is resonating with your audience. Every six months check back in with this process. It doesn’t have to be a full run through of everything, but you should at the very least analyze your new top performing content and solicit customer feedback on what you’re putting out there. 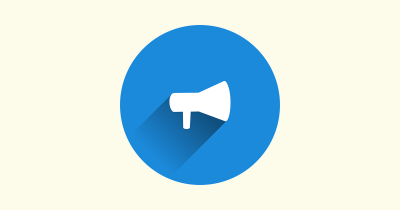 Your tone of voice will inform the way you produce marketing collateral. However, it’s also fluid. As your audience changes and develops, so must you. Generally speaking, the changes will be minimal. However, over time they add up. If you’re never optimizing, you might find that in a few years your original key audience has moved on and you’re once again left drifting directionless trying to figure out what might work. Congratulations! You now have an ongoing, updated tone of voice for your brand which is a data backed proved method of creating content your key audience wants to see. The next step is to marry it with your swiped content to understand how you can deliver the right message in a unique tone o voice. I can’t go into detail on that here, but I can link you to an awesome guide on conversion copywriting written by yours truly on this very site. If you can successfully manage to marry both this and the conversion copywriting guide the hard work is done for you. You’ll have a unique tone of voice that resonates with your audience, and you’ll know exactly what topics and phrases most resonate with them. The next stop is profit town. Look back up at some of the pop music examples I mentioned before. These people did not decide on a pop career, devise a unique persona or angle, and immediately reap the benefits. The iterations for which they are most famous came after years of trial and error. While the process outlined here should minimize the timeline for you, don’t expect it to be a process you can implement once and see incredible results. It might take you a while to really narrow down on the tone of voice that best resonates with your audience. Until then, all you can do is keep on optimizing based on your audience’s engagement. If you’ve any questions or have your own take, drop a comment below.